How do you get those perfect grill marks on your steak? 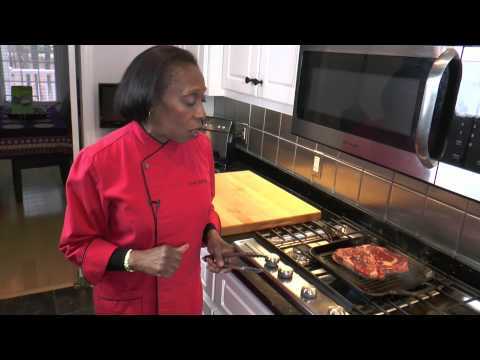 You watch Chef Belinda. There’s a trick or two you can use to create beautiful sear marks like the ones you see on the gorgeous grilled meats at steakhouse restaurants. Searing—whether done on an outdoor grill or a stovetop grill pan—gives your steaks a robust, caramelized flavor. Watch how they sizzle to a mouthwatering finish that looks great on a plate. Need an easy marinade to prep your meat for the grill? Try this simple blend of ingredients that may already be in your pantry or refrigerator. Combine all ingredients. Put steak and marinade in a plastic, zip-close bag. Marinate overnight or at least 8 hours. Cedar-plank-grilled salmon with lime dressing – Take your salmon up a notch by basting it in a zesty sauce and grilling over a cedar plank.